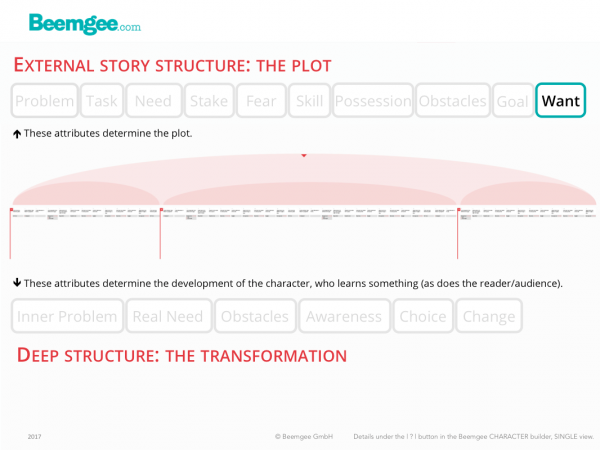 How narrative structure turns a story into an emotional experience with a happy end. Beemgee is increasingly involved with charities and non-profit organisations, supporting them in their efforts to tell their stories. Storytelling is uniquely suited to the communications of organisations that help people in need or seek to raise awareness for social injustices. This post was originally conceived as an introduction to the principles of storytelling for people working in non-profits. It has been adapted from a post we provided to FundraisingBox (German language). Storytelling is a bit of an overused buzzword. While we are all – by dint of being human – storytellers, how aware are you of the principles of dramaturgy? What exactly constitutes a story, in comparison to, say, a report or an anecdote? And just to be clear, the following is not a story. It’s an how-to article. Whatever the medium – film or text, online or offline –, storytelling has something to do with emotionally engaging an audience, that much seems clear. So is a picture of a cute puppy a story? Hardly. Stories exist in order to create a difference in their audience. Stories always address problems and tend to convey the benefits of co-operative behaviour. While there simply is no blueprint to how stories work, let’s examine the elements that recur in stories and try to find some patterns. All stories are about someone. That someone does not have to be a person, it can be an animal (Bambi) or a robot (Wall-e). But a story needs a character. In fact, all stories have more than one character, with virtually no exceptions. This is because the interaction between several characters provides motivation, conflict and action. Stories are about people who want something. Marty McFly wishes to be a musician (character want). He also wants to get Back to the Future (plot want). The wish or character want is a device which adds cohesion to the story, usually in the form of the set-up/pay-off. Marty is seen at the beginning of the film practicing the guitar; at the end of the film he plays at a concert. The wish is a useful technique to make the character clearer to the audience, but it is not essential to composing a story. Indispensable is what we have called the plot want. 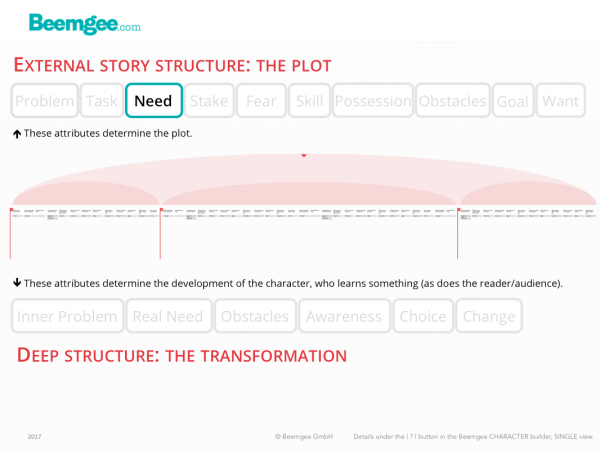 As a result of the external problem – the trigger event that sparks the chain of cause and effect which the bulk of the plot consists of –, the character feels an urge, which provides the motivation for the character’s actions in the story. The want is the state after which the character strives, and is distinct from the goal. In this post we’ll be talking about active vs. passive characters, motivation, the difference between a want and a goal, a couple of writer traps to avoid, and contradictory wants. Characters have to be actively acting of their own volition. The want has to be urgent and strong enough for them to do things. If the want is missing or too weak, the character will lack motivation and appear passive. A passive character is usually not interesting enough to hold the audience’ or readers’ attention. An evolutionary explanation of stories as practice for problem-solving attempts to shed light on the phenomenon: When characters react to events rather than cause them, they appear weak, like victims. Which means that there is not much we can learn from them. 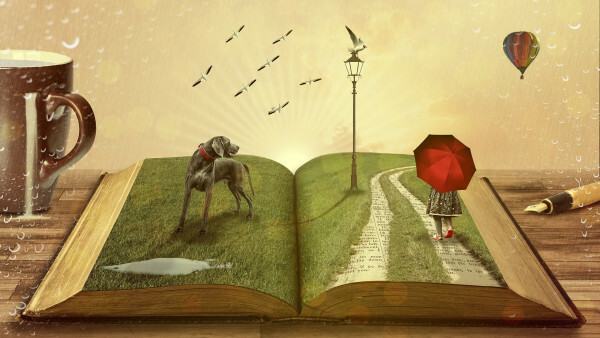 Humans experience stories physically and emotionally (our hearts beat faster, our palms sweat), and since we learn from experience, we instinctively prefer stories which provide us with experiences that benefit us in some way. Which tends to be the case when we experience stories of self-motivated problem-solving. There is a good reason for that cliché about actors always asking about their motivation. 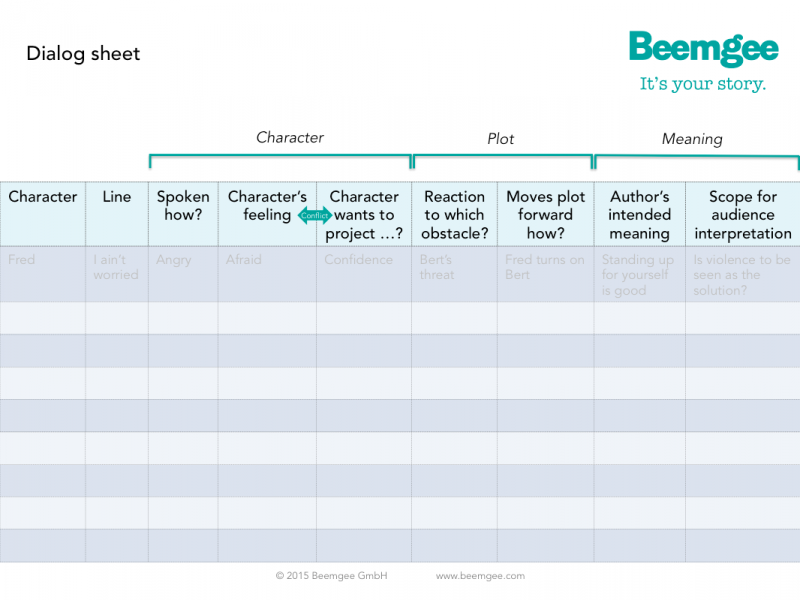 It is motivation that prompts the characters in a story to do the things they do. Stories seem to work best not only when characters are active rather than passive, but often when they have comprehensible reasons for their activity. The reason for what a character wants is usually comprehensible for the audience or reader because of the external problem. In simple terms, the character wants to solve the problem. Take the Cinderella story as an example. Her problem is that she is bound to the stepmother and her two nasty daughters. In other words, the want is a vision the character has of his or her situation without the problem. Hence what the character wants is actually a particular state of being. Such a state might mean being in a position of wealth, power or respect, or being in a happily ever after relationship. Cinderella wants merely to be free of her involuntary servitude, if only for a little while. This makes the want distinct from the goal, which is the specific gateway to the wanted state of being, as perceived by the character. A story usually sets up a goal the character needs to reach or attain in order to achieve the want. In Cinderella’s case, it is attending the ball. So, a story has its characters pursue their wants. These different wants oppose each other, causing conflicts of interest. The conflicting wants make the characters active, and the audience/readers like stories about actions, that is, about characters who do things. And yet frequently stories seem to mess up on this vital point. Next to passive characters without a strong enough want, lack of clear motivation is a huge writer trap. It is possible to write a whole story full of characters who are reactive instead of active, or who do things of their own volition but without that volition being clearly recognisable to the audience/reader. It is perhaps even tempting to write stories like that, because they seem more lifelike. In real life, people do not necessarily have distinct goals. Often, our wants are vague and not clearly definable. What about writing a realistic story about a character with a general sense of dissatisfaction, who, like so many of us, has lost sight of any clear objective in life? It’s doable, certainly. But the audience/readers will probably start to look for the specific want of such a character. They would probably begin to expect the story to be about this character’s search for a clear objective in life. That might be the want the audience would tacitly ascribe to the character. And if the story does not bear such motivation out, the risk is significant. Because stories in which the audience does not understand what the characters want lack emotional impact. A way of adding psychological depth and emotional complexity to characters is to give them several and even contradictory wants. Gollum in Lord Of The Rings wants the ring. Yet a part of him also wants to give up the ring and help Frodo. Next to solving the case, Marty Hart in True Detective wants to be a good husband and family man, but he also wants affairs with other women. That’s three wants for one character. A want is not merely a yearning, it is an expression of values. What a character desires shows the audience something about that character. In this sense, two contradictory wants provide the basis for a powerful scene of choice. At a crisis point, the character may face a dilemma and have to choose between two courses. Both might lead to some state the character desires, but these desires prove to be mutually exclusive. For the audience, which choice is the right one might be obvious – they will be rooting for the character to go one way. But for the character there may be a strong pull the other way. The final choice shows the character’s moral fibre – and often expresses the story’s theme. Is it really always absolutely necessary for every character to have a clearly defined want? Not entirely. Because, of course, there are exceptions. In certain cases, the author might deliberately obfuscate the why of a character’s actions in order to inject mystery. Not knowing something keeps the audience/reader guessing and turning the pages or not switching the channel. Usually this mystery is cleared up at some point. The audience tends to expect that. Which implies that even if the want was not made clear to the audience early in the story, it was there in the character nonetheless – and certainly the author was aware of it. Injecting mystery by keeping character motivations hidden is not in itself a writer trap. But nearly. When tempted to use such a device, an author should at least consider if it would not actually be more interesting for the audience to know the character’s motivation. Having said that, there are rare cases where a character’s motivation does remain unexplained. And those cases can be powerful. Especially when it’s a baddy we don’t understand. Think of Iago in Shakespeare’s Othello, who is simply bad to the bone and we’ll never really know what made him so. Shakespeare – deliberately, one presumes – gives no hint as to what Iago hopes to achieve by ruining Othello. Shakespeare might easily have given Iago some clearly understandable motivation, such as revenge of a past wrong, envy of Othello’s success, desire to usurp Othello’s position, lust for Desdemona. But he didn’t. And Iago is one of the most superb villains ever. But perhaps the most interesting thing about a character’s want is how it stands in conflict with what that character really needs. We humans have a built-in predisposition to expect agency. We look for the person or thing responsible for any action or phenomena we experience; we seek to ascribe “agency” to what we perceive. What this means is that when we notice that something happened, we tend to look for the cause of the event. This probably has a simple evolutionary explanation. If we hear a rustle in the bush behind us, we immediately turn around to see what moved. This reflex is a safety mechanism to detect threats. Before homo sapiens lived in houses, the individuals for whom this reflex worked most efficiently probably lived longer, and thus had better chances of passing on their genes. The point is, we assume that something or someone caused the phenomenon (the rustle) and seek to attribute it to an agent. If we are sitting in our living room and hear a floorboard creak in the hall, we would want to know what caused it too.